The U.S. Bureau of Labor Statistics has estimated the annual average ultrasound technician salary in 2016 at $71,750, or $34.49 per hour, based on a 40-hour working week. For sonographers, these hours are typically divided between scheduled shifts, overtime, on-call time and call-in hours each at a different hourly rate. A sonographer salary is usually accompanied by a benefits package with some items paid in full by the employer and others partially funded. Employer-funded benefits often include paid vacation and sick time, disability and life insurance, and continuing education. Typical partially funded benefits include health and dental insurance for diagnostic medical sonographers and their families as well as 401k or 403b retirement plans that contain matching employer contributions. The statistics bureau derived its average wage estimate from a total of 65,790 sonographers working in the U.S at the time of its most recent report. The industry-wide pay scale presented ranges from an average of $48,660 for the 10th percentile to $99,100 for the 90th with a median of $69,650. 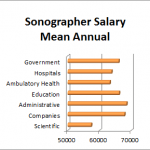 A few sonographers at the very top end of the scale earn six-figure salaries; even for those earning five figures, salaries are robust given that the majority of sonographers have two-year degrees. In fact, sonographer salaries compare favorably with some related fields such as nursing in which four-year bachelor’s degrees are normally required to earn comparable salaries. The above sonography salary data does not include self-employed ultrasound technicians, but data gathered on a regular basis by the SDMS indicates that a quarter or more of its self-employed members receive at least $100,000 in compensation. However, self-employed sonographers deduct their expenses from gross pay and are responsible for paying both employer and employee amounts for federal, state, Social Security and Medicare taxes, so total self-employment compensation may result in considerably less net pay. 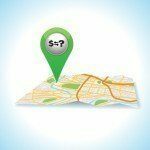 Those interested in self-employed work typically also buy their own health, dental and disability insurance, save for their own retirements without matching funds, and otherwise manage their sonography careers as self-employed businesses. 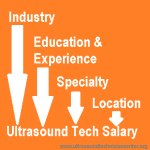 Because of strong demand for sonographers across the country, the average salary of an ultrasound technician in 2016 and beyond is expected to continue rising as demand outpaces supply. 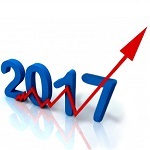 A detailed presentation of national data on sonography salaries from 1999 through 2016 is available at Ultrasound Income Data by Year and shows the long-term trend for both hourly and annual wages. You can also visit Ultrasound Salary by Industry From 2004 to 2016 for the long-term trend breakdowns by industry.